The Cabinet Office announces the appointment of the Hon. 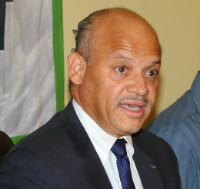 Michael Foulkes as Parliamentary Secretary in the Ministry of Social Services and Urban Development, effective 30 January, 2019. As Parliamentary Secretary, Mr. Foulkes will be responsible for assisting the Minister of Social Services and Urban Development, the Hon. Frankie Campbell.